The Sistine Chapel Choir Visits CUA! The Sistine Chapel Choir visited Catholic and the Basilica of the National Shrine for the first time in more than three decades on Wednesday, September 20th. 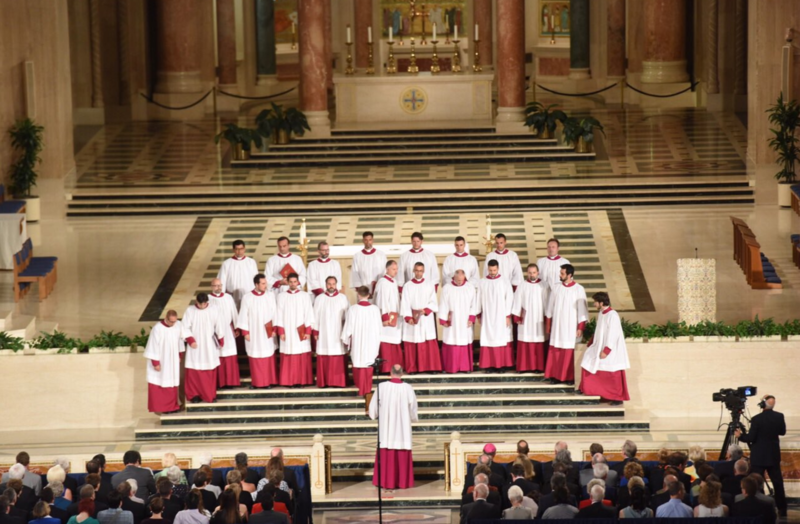 The “Pope’s Choir” brought CUA students, faculty, D.C. residents, and some noteworthy politicians (including Newt Gingrich) together for a wonderful evening of choral music. The ethereal atmosphere, a combination of pure vocal sound and echo bouncing off the stone walls, certainly complimented by the excellent acoustics of the Basilica, made for a performance that was quite memorable. Selections included traditional pieces by Giovanni Palestrina (such as Sicut Cervus and the jubilant Exsultate Deo), Gregorio Allegri (Miserere), and a haunting encore by Monteverdi. The Tower had the unique opportunity to interview one of the Sistine Chapel Choir singers, Giuseppe Dalli Cardillo, as well as the conductor of the choir himself, Maestro Massimo Palombella. Cardillo gave a wealth of information and informed us that the Choir is in fact on tour, a rarity as the group has many responsibilities at their home in St. Peter’s Basilica and rarely has the time for such travels. After performing in New York and now in Washington D.C., the choir will next perform in Detroit before they head back home to Rome. After being asked about his experience so far in Washington D.C., Palombella told the Tower about another reason for the group’s extended travels. “We come to evangelize,” Palombella said. The group presents extremely beautiful music, but its mission and most important goal is to deliver a message from the Catholic Church. The Sistine Chapel Choir is truly on a mission to spread the Good News around the world, specifically through the medium of sacred music. On a lighter note, when asked about his frequent interactions with Pope Francis, Palombella happily said that working with the Pope “is never work,” confirming that the pontiff is indeed as friendly and agreeable behind the scenes as he appears on screen. When requested to compare the acoustics of the Basilica of the National Shrine to that of Saint Peter’s Basilica in Rome, Palombella gave an entertainingly unusual response to the Tower. According to him, St. Peter’s was: “Originally built for celebration alone,” he said. And therefore its acoustics are not ideally suited to choral music. In fact, Palombella prefers the sound inside the Basilica of the National Shrine! However, when in Rome, Palombella opts to perform in the Sistine Chapel, a suitable choice for the Sistine Chapel Choir. We thank the Sistine Chapel Choir for visiting us, and Giuseppe and Maestro for answering our questions making the experience so much better! Stay tuned to The Tower’s Arts and Entertainment column for more upcoming musical events and opportunities in and around campus.